How are the Combatant Commanders thinking about Climate Change? The U.S. Senate Armed Services Committee has been holding hearings with the U.S. combatant commanders over the last several weeks. The combatant commanders have been briefing their posture statements for their individual geographic Areas of Responsibility (AOR). Here are what the combatant commanders had to say about climate change in their prepared remarks. Senator, there’s no question but that environmental security can have a dramatic effect on overall security, both in individual states and more regionally. I would tell you my frank assessment is that we’re having better success in response to environmental security challenges than we are finding traction for preventative or predictive actions that could be taken. On the good side, we have incorporated in a number of regional exercises, which we conduct over the course of this fiscal year, 16 exercises involving as many as 30 different African states that will have as a component of that exercise response to an environmental disaster of some sort, mostly water-related, either flood or drought. We are finding that the African nations are very accepting and understanding of the security impacts of such issues. As I indicated, though, we’re finding — and perhaps because it’s more difficult — we’re finding less traction on the preventive steps than we are on response. Continue reading the full exchange here. General Mattis’s posture statement did not include any mention of climate change, which is expected given that CENTCOM is charged with managing the war in Afghanistan and addressing emergent issues in the Persian Gulf. Of course, General Mattis may have many thoughts about climate change within his AOR; I have no reason to suspect otherwise. Nevertheless, climate change is a challenge that should be integrated into CENTCOM’s strategic planning given the range of resources issues in the region that could be exacerbated by climate change, from water scarcity to food shortages. Climate change in the Arctic makes it one of the world’s most rapidly changing environments. As the volume of Arctic sea ice decreases, access continues to increase permitting maritime traffic into areas previously impassable without specialized vessels. This new access is creating opportunities for transit, development, and natural resource extraction. While some see these changes as a potential breeding ground for conflict, we see the risk of armed conflict as low, and continue to approach the Arctic as an area of cooperation among Arctic nations. The progressive opening of the Arctic represents both challenges and opportunities. Climate change in the Arctic is impacting the land and seascape, creating opportunity for increased human activity and presenting a new set of regional vulnerabilities and potential resource competitions. Emerging Arctic challenges require deliberate preparation to ensure economic access and freedom of maneuver, and to prevent irresponsible actions. As the Arctic opens, there will be a marked increase in human activity in a push for resources (e.g., fish, diamonds, natural gas) and eco-tourism. Special capabilities will be required to operate successfully in the Arctic. For instance, icebreakers are an essential capability for the United States to exercise our responsibilities. I believe the nation should continue to exercise freedom of navigation to assure access to this new dimension of the maritime domain. The U.S. alliance with Australia anchors USPACOM’s strategy in Oceania. Australia, with additional contributions from New Zealand, invests extensively in security and assistance efforts in this sub-region. The Australian continent notwithstanding, most of Oceania is comprised of Pacific Island nations spread across the vast expanse of the South Pacific Ocean. Security challenges associated with natural resources in this sub-region tend to predominate. In particular, illegal fishing, resource damage attributed to climate change and global warming, and the susceptibility of low lying island nations to typhoons and tsunamis define USPACOM and U.S. Coast Guard approaches to engagement in Oceania, often in concert with Australian and New Zealand actions. In addition to the threat posed by transnational organized crime, the region is also vulnerable to humanitarian crises, mass migrations, and natural disasters. United States Southern Command remains a committed and responsive partner in foreign humanitarian assistance and disaster relief efforts. To enhance partner nation preparedness, we strengthen the humanitarian assistance and disaster relief (HA/DR) capacities of regional militaries-through our multinational training exercises and security cooperation activities. Our efforts are yielding long-term dividends while also promoting the shared responsibility and costs of regional leadership in responding to catastrophes. Countries such as Guatemala, El Salvador, Costa Rica, and Colombia have demonstrated an increased capacity to respond to natural disasters without asking for U.S. or international aid, a testament in part to the effectiveness of our programs. 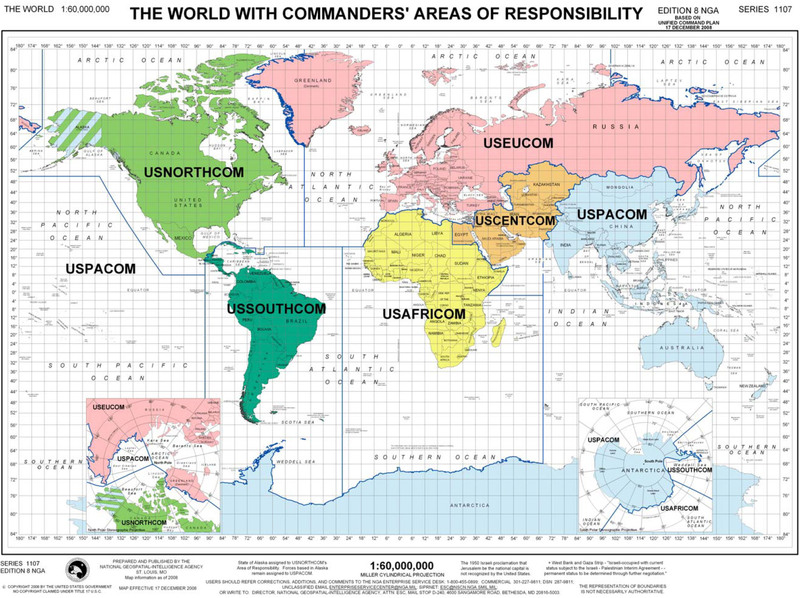 United States Southern Command is also watchful for potential geopolitical turbulence that could impact U.S. citizens and military personnel in the region, particularly in Cuba, Haiti, Bolivia, and Venezuela. Fidel Castro’s leadership transition to his brother Raul is complete, but the long-term effects of the government’s market reforms remain to be seen. Haiti, while making slow but steady progress, remains vulnerable to natural disasters and economic hardship. Public demonstrations in Bolivia related to wages, food prices, and energy shortages are likely to continue until the government addresses the underlying causes of social turmoil. Again, these quotes are excerpts from the combatant commanders’ posture statements, with the exception of the Q/A exchange between Senator Mark Udall and General Ham. I will continue to review the transcripts from the hearings to see if any of the other combatant commanders had similar exchanges on climate change. By Francesco Femia & Caitlin Werrell in climate-security, defense on March 20, 2012 .